In 2005, Nintendo shut the door on the original Game Boy with the miniscule Game Boy Micro, a brilliantly-engineered two-by-four-inch rectangle of compromise. It wouldn't run original Game Boy or Game Boy Color titles — just Game Boy Advance games — but boy was it pretty. Many people hated it. I just bought a new one, and I want to share it with you. Inspired by a young boy's love and the prospect of pink and sparkly buttons, I finally gave in to a craving I've been carrying around for nearly eight years. North America's Game Boy Micro was black or silver, with collectible face plates available for those craving customization. In Europe and Australia they had pink. I love pink. I needed pink. This is the most adorable gaming-related story I&apos;ve read all week. 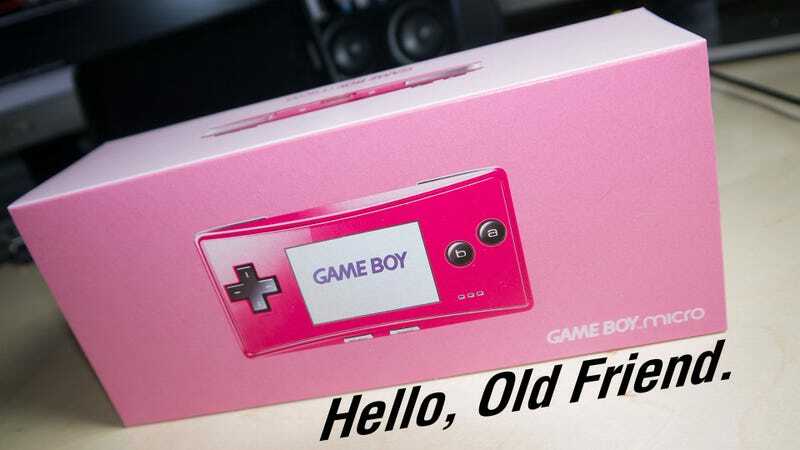 So last week I found a guy online selling an unopened pink Game Boy Micro from Europe for $150, and I exchanged currency with him. I could have purchased a used one for a great deal less, but then how would I share this special moment with you all? What will I play on this little marvel? What games will I use to strain my aging eyes beyond all reason? There will be Final Fantasy Tactics Advance, for one. I never finished the original, as my Game Boy Advance SP was stolen from my car with my copy in it, 40 hours in. I'll probably pick up a little Mario, some Sonic, the two Klonoa games, and Riveria: The Promised Land. But until I find prices for those games that appeal to me, I'll be stuck with this. Welcome back, my little friend. You may be the incredibly limited version of the Game Boy Advance that paved the way for the age of dual-screen Nintendo handhelds, but you'll always have a place in my pants. Edit: the article originally referred to the Game Boy Advance release date as 1995. This is because the author is a time traveler.